Ultra gloss ‘still wet’ look. Durable, scuff and rub resistance far greater than any water-based varnish. Lower than permissible ozone emissions. Printing and curing on heat sensitive materials. The lowest fire and heat risk available. UV provides converters an economic and environmentally safe means to deliver maximum graphic and protective varnish capabilities to their customers. For most applications UV provides a look which easily competes with film lamination, and often exceeds pre-print. UV allows converters to differentiate themselves from their competition, add extra value to the finished product, dramatically increase productivity and provide customers with attention grabbing graphic treatments. Unlike conventional systems that use air to control the head temperature, JB Machinery uses environmentally-friendly filtered UV technology. 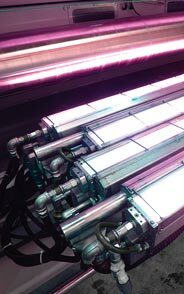 The UV head assembly and lamp zones are cooled by chilled deionized water circulated through the filter tube located between the lamp and drying surface. This eliminates the need for shutters, any press modifications, minimizes fire risk, carries away unnecessary IR heat and reduces ozone production to levels below that required by government regulations. The JB filtered system also eliminates the need for the space consuming internal and external air duct systems required by conventional UV systems. Short lamp technology and air-cooling are also available options for specialized applications. Specifically designed for high power level applications, the JB Machinery Super UV Lamps emit 25 to 100% more UV radiation without requiring any additional electrical power. This power saving design allows a typical 400 watt/in Super UV Lamp to equal or exceed the performance of a standard 600 watt/in mercury vapor lamp while only emitting the IR radiation of a 400 watt/in lamp. 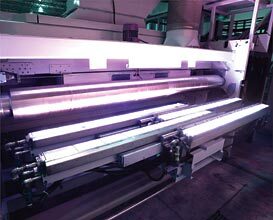 Additionally the JB system provides rapid on/off control of the UV lamps optimizing production time, conserving energy and providing zone control options for spot varnish applications. © Revolution Industrial Pty Ltd, 2012-2017. Unauthorized use and/or duplication of this material without express and written permission from this site’s author and/or owner is strictly prohibited.